We got black full accoyos! Touchdown, Cairo, Cape Town and Richard. They are all BLACK full accoyos! Producing dark full accoyo is one of Sunny Alpacas’ missions. BLACK ACCOYO JACKPOT is the ONLY SOLID BLACK FULL ACCOYO MALE ON EARTH! Yes Sir – No Contamination! Truly EXTAORDINARY in EVERY SINGLE WAY! Sydney is a gorgeous Full Accoyo Light Fawn female! She has excellent staple length, showing beautiful brightness, excellent crimp, and extreme density. All of this while carrying an extremely fine fleece! This should come as no surprise considering her ancestry. Sydney is the result of matching our Michelangelo Full Accoyo White Dam Cordina to our stud Accoyo Principe Dorato. This EL Nino/Legacy cross continues to produce outstanding crias, and Sydney was no exception! HFAR Accoyo Maderia is the product of breeding our Full Accoyo Principe Daughter to LLC & TKAF Black Accoyo Jackpot. Maderia is maturing into an amazing Light Fawn full accoyo female. With tight bundles in her fleece and packing on the fleece with nice density, Maderia is destine for greatness. Her sire is LLC & TKAF Black Accoyo Jackpot WIth Extreme ACCOYO density, skin folds down this neck and on his hips., his fleece is PACKED on – providing full coverage nose to toes. Extreme FINENESS! – AFD on cria tips 14.27! Stunning Consistency & Crimp Style – Tight knotty spiral twisted matchstick bundles that are on his face, neck, body & legs! Same everywhere! His fleece has brightness & luster & almost a greasy feel. Maderia's dam Sydney is a gorgeous Full Accoyo Light Fawn female! She has excellent staple length, showing beautiful brightness, excellent crimp and density all of this while carry an extremely fine fleece. Although this should com as no surprise considering her ancestor. Sydney is the result of matching our Michelangelo Full Accoyo White Dam Cordina to our stud Accoyo Principe Dorato. 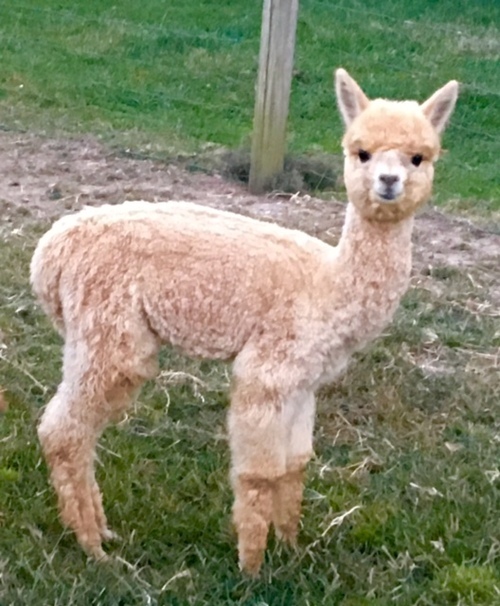 This EL Nino/Legacy cross continues to produce outstanding cria and Sydney was no exception!